What it’s like to be an archaeologist watching ISIS and other groups destroy important sites in the Middle East. 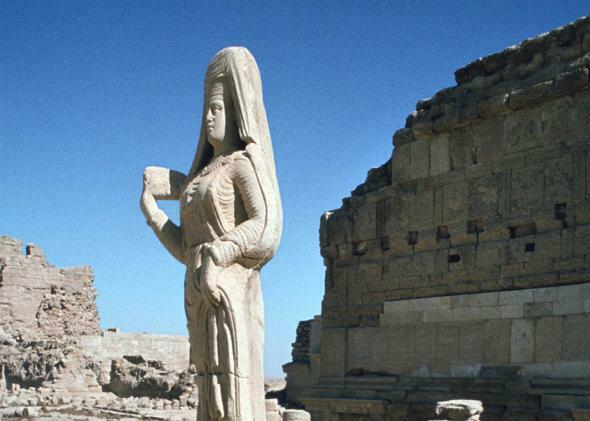 Statue of a Parthian princess, in Hatra, Iraq, pictured in 1977. Hatra is one of the sites that have been destroyed by ISIS in recent months. The well-publicized destruction of archaeological sites and museum exhibits by ISIS has garnered worldwide condemnation. Sites like Nineveh, Hatra, and Mosul have been the subject of concerted efforts to destroy the past—and to help goad the United States into a third ground war in northern Iraq and Syria. Recently, we received some good news. It turns out that almost all the objects in Syria’s museums have been hidden away. * So perhaps things aren’t quite as bad as they appear? This creates a tricky ethical dilemma for me. What should I do when I see military presence at such sites? If I publish about it, would I assure that the sites would be bombed, thereby creating even more destruction than construction of the military facilities caused in the first place? Can I take it for granted that the U.S. military already knows about these places? Surely they have even better satellite imagery than I do. But the theater of war is a big place: Lebanon, Syria, and Iraq together are roughly the size of Texas. Archaeologists have rarely confronted these circumstances, and our standards of acceptable practice and ethnical behavior with remotely sensed data are still in development . The American Association for the Advancement of Science has recently published an online cautionary note, but its text is quite general and does not cover the situations I’m encountering. So I’m going to describe some of what I’ve seen, but I won’t be using any site names except for Apamea, Syria, and two sites in its immediate vicinity. A declassified Corona satellite image from Nov. 20, 1968, shows Qal’at al-Mudiq in the left-center, the large, classical period site of Apamea immediately east of it, and Tell Jifar in the right-center. A Corona spy satellite image taken of the environs of Apamea on Nov. 20, 1968, shows the classical period site in the center, surrounded by its walls. On the left edge of Apamea proper is the ancient citadel of Qal’at al-Mudiq. Originally a Roman construction, the present citadel was built by Muslims in the 12th century, and it is still inhabited. To the east along the drainage can be seen the site of Tell Jifar, a Bronze Age settlement that was intact in 1968. The main site and its environs were already impacted by construction of three large, earthen dams, starting in the early 2000s. Tell Jifar was substantially reworked as a result of the construction of the dams, probably as a source of fill dirt for the eastern dam. 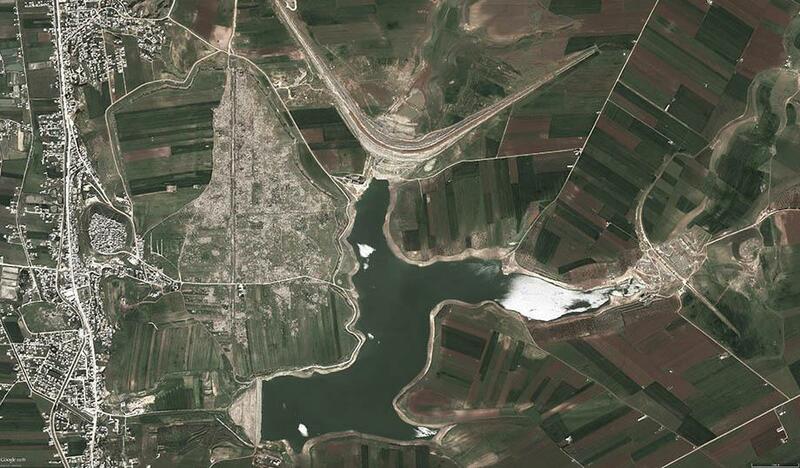 A Digital Globe image in Google Earth from April 3, 2012, shows extensive looting all over the eastern part of Apamea, and construction, completed before the outbreak of the civil war, of three large, earthen dams to create the reservoir. 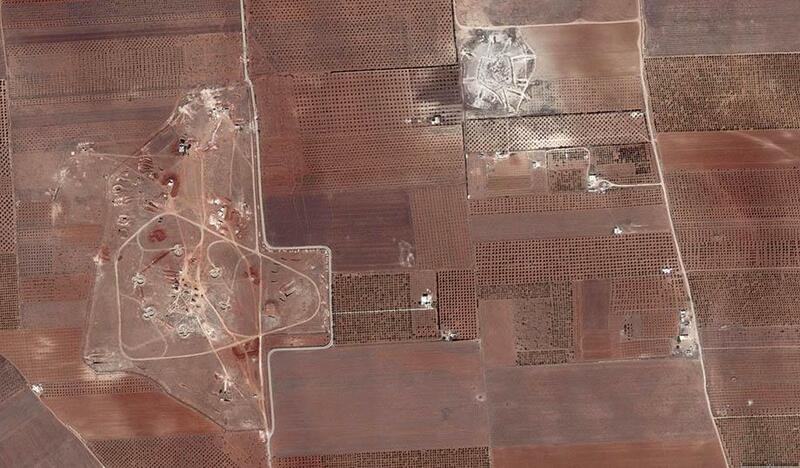 Between July 2011 and April 2012, satellite imagery (above) shows that the site was extensively looted. Media reports concentrated on the looting and subsequent sale of artifacts from the site, which benefitted the Assad regime. But the looting is only part of the story. The satellite images shown here illustrate what’s been happening in a broader context and link the environs of the site into the larger story of the Syrian Civil War. At the time the looting of Apamea occurred, the town of Qal’at al-Mudiq was being contested between Syrian government and rebel forces. During the 2011–2012 period, the citadel and Tell Jifar were occupied by the Syrian army, but the rest of the lower town was in the hands of rebel groups. On the ground, Syrian forces backed by tanks attacked the central town of Qalaat al-Madiq and other areas on Wednesday, sparking clashes which cost at least 21 lives, the Syrian Observatory for Human Rights said. … The monitoring group said four civilians were killed in shelling, while five rebel fighters and four soldiers died in fierce clashes in Qalaat al-Madiq and surrounding villages. It said troops entered the town of Qalaat al-Madiq, in Hama Province, just after dawn following a 17-day barrage of shelling and heavy gunfire to root out rebels. The army, however, was not in full control of the town. So what happened? 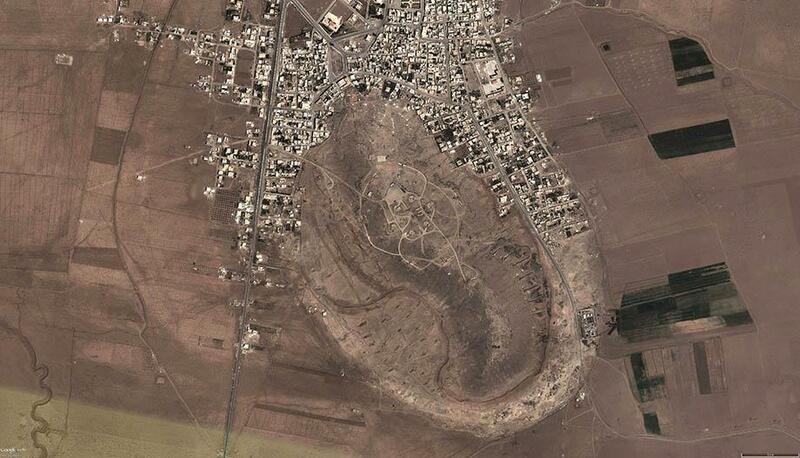 The Syrian army dug tanks into the top of Tell Jifar, which can be seen in the close-up satellite image. And it used its strategic vantage point in the citadel to call down indirect fire on the lower town. A close-up view of Tell Jifar shows tanks and artillery dug in on top of the site. The Syrians, the Lebanese, the Palestinians, ISIS, everybody who fights in the Middle East uses archaeological sites this way because they are often located on prominent hilltops that offer commanding views of the countryside. Palestinian fighters, Hezbollah, and rebel groups in Syria occupied crusader castles, such as Beaufort in Lebanon and Krak des Chevaliers in Syria, and these ancient fortresses have been subjected to repeated air attacks. Beaufort has been all but destroyed. Bashar al-Assad’s army has constructed numerous surface-to-air missile sites on prominent archaeological tell sites in western Syria, where I’ve been looking at sites. They are easy to spot. The Syrians purchased enormous amounts of military hardware from the former Soviet Union, including surface-to-air missile systems. Soviet military manuals, describing how such places were to be constructed, came with the hardware. Such sites can be recognized in Digital Globe/Google Earth imagery because they feature a tell-tale footprint of six firing positions with a central control position. In the picture below, you can clearly see that a small archaeological site in the northeast corner of the frame has been expanded into an even larger defense facility. I’ve counted at least two dozen like this one in Lebanon and Syria. The small archaeological tell site in the upper right corner of this Digital Globe/Google Earth image, from Jun 28 2010, has been converted into an air defense site, which was subsequently expanded into the much larger SAM site to its southwest. Another example is this small Bronze Age (roughly 3500 to 1200 B.C.) site, about which little is currently known. It has been turned into a military strongpoint, complete with concrete bunkers along the curved earthen berm on the northwest side, zigzag trenches, and numerous positions for fighting vehicles. 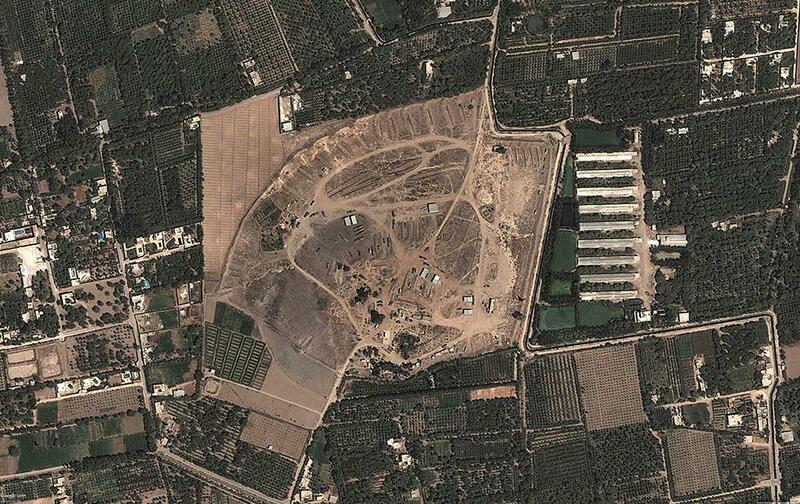 The long trucks in the center of the site possibly haul missile reloads. Thr Bronze Age tell site shown in the center of this Digital Globe/Google Earth image, from Feb. 26, 2013, shows that an entire military complex, including bunkers, slit trenches, and other installations has been built on and around the site. A third example is the tell site with Early and Middle Bronze Age, Hellenistic, Roman, and Byzantine remains shown below. The entire hill on which the site is situated has been turned into a surface-to-air missile battery and military camp. The SAM site is easily visible on top of the hill, and there are numerous trenches dug into the sides of the hill for armored vehicle revetments and storage/hiding of SAM reloads. There are several structures that appear to be bunkers, with sloping, concrete-lined ramps going into and out of them, and there are numerous military trucks on the site. The edge of the site is bermed with a raised, earthen barrier to create firing positions for infantry. It’s a prime military target, and I would be surprised indeed if it’s still intact. An April 25, 2012, Digital Globe/Google Earth image of this site shows a surface-to-air missile battery and military camp. Let’s not deceive ourselves. Modern warfare in this ancient land means that archaeological sites will be used for military purposes and destroyed by air attacks because they have become legitimate military targets. 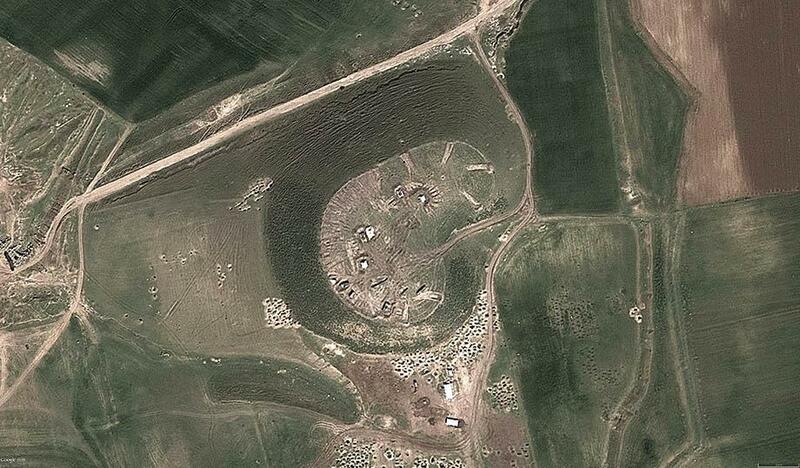 So if you thought ISIS was the only perpetrator of archaeological site destruction, think again.